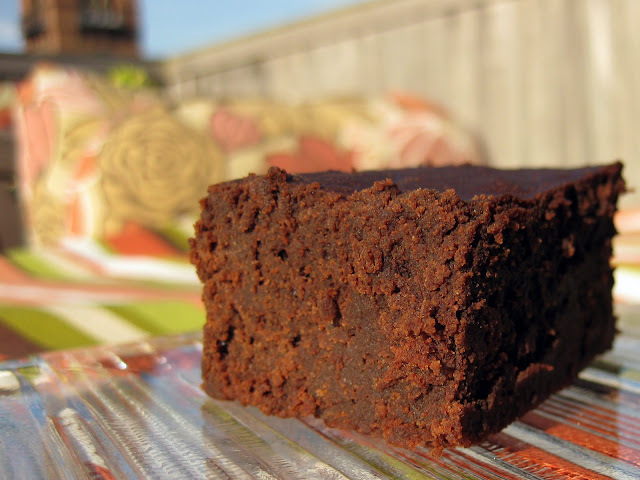 Did paleolithic humans eat brownies? Proooobably not. But I think they could have. Key ingredients? Probably nuts, cocoa, eggs, and honey/fruit for the closest approximation. After hearing from a friend who is following a paleo lifestyle (consuming only foods that were available to our paleolithic ancestors) about the perils of searching for a tasty brownie recipe that only uses paleo ingredients, I decided to take on the challenge. I began by selecting 5 paleo brownie recipes to make and then subjecting them to deep taste-testing scrutiny. Read on for how it all went down. Paleo ingredients include foods that can be hunted/gathered (meats, fish, eggs, fruits, nuts, seeds, vegetables, mushrooms, herbs) and exclude foods attributable to the agricultural revolution and animal domestication (grains, legumes, dairy products, salt, refined sugars and oils, and other "manufactured" foods). So, making a "paleo brownie" means removing almost every standard brownie ingredient from the recipe: sugar, flour, butter/oil, milk/soymilk. Chocolate bars and chocolate chips are also out - they often contain sugar, dairy, fats, and soy. This reductive process pretty much leaves you mostly with cocoa powder, eggs, and creativity. I searched for what people claimed to be the best paleo brownie recipes on the interwebs and tested them. For each recipe reviewed below, I provide a picture and a few notes about the flavor, texture, appearance, "cut-ability," and the recipe. I may have cut a few corners (see "special flavor-enhancing ingredients" below), but next week I'll be searching for my own answer to the question "How to make a delicious paleo brownie." I may also look for ways to cut back on honey and rely more on fruit as a sweetener. Coconut oil: Most paleo communities online are open to using coconut oil. I used some in the last two recipes, but it imparts coconut flavors to the brownie, which I hope to avoid when I design my own recipe. I'd like a taster to not know whether the brownie is paleo or normal. Eggs: I used them, though some paleo followers watch their egg consumption. In the coming week, I'll be experimenting with egg-free paleo brownies and will share the results in next week's post. I've come up with a version that can be made with or without an egg. Special flavor-enhancing ingredients: These might not be paleo, but are included in tiny quantities, have very little nutritional impact, and deepen the chocolate flavors (which is important, considering everything else I'm leaving out): vanilla extract, chocolate extract (not chocolate flavoring, but rather chocolate overtones that deepen chocolate flavor), espresso powder (1 tsp undetectably deepens chocolate flavor without adding a coffee flavor), salt, baking soda (doesn't add to chocolate flavor, but helps the brownies rise). A note about finding ingredients: Whole Foods had all of the ingredients I was looking for, including coconut flour , almond flour , coconut oil , ground flaxseed , and chocolate extract . If you have trouble finding any of these specialty ingredients, I've provided Amazon links in the previous sentence. 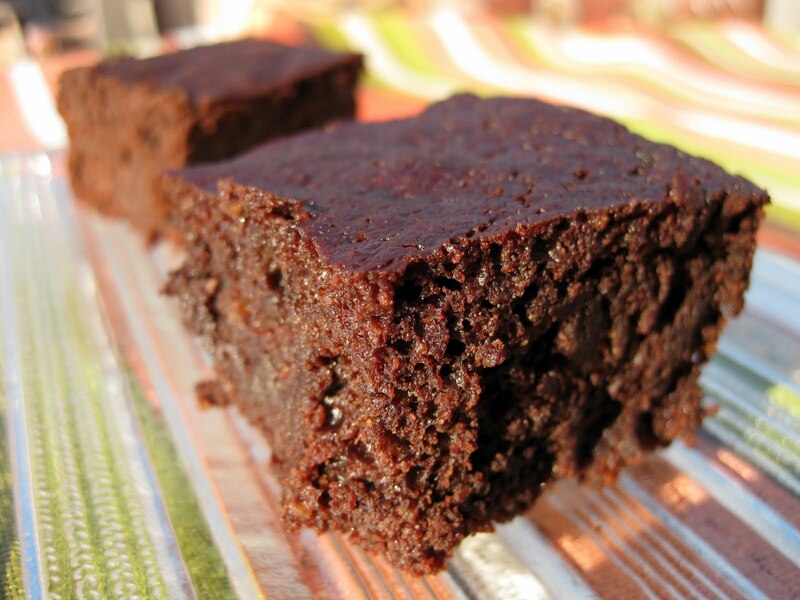 Paleo Brownie Recipe 1 relies on honey and almond butter for sweetness, body, and fats. Flavor: Chocolatey, and the almond butter imparts a slight fruity flavor. Texture: True chewy brownie texture. Turned out a bit dry for me (though not everyone thought so). Blend almond butter and honey until smooth (may need to heat gently). Add eggs, vanilla extract, chocolate extract, and espresso powder. Blend cocoa, salt, and baking soda. Line a 9x13 pan with foil or parchment paper (or grease with your preferred oil), pour batter in and smooth out with back of spoon. Bake at 325F for ~30-40 minutes. 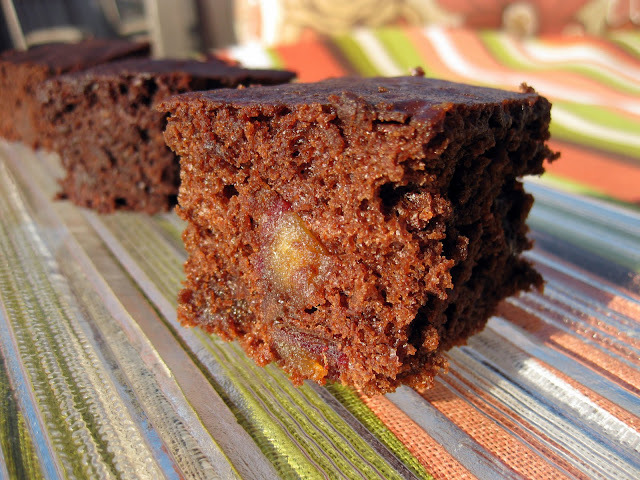 Paleo Brownie Recipe 2 incorporates honey, diced apricots and almond butter. Flavor: Not too chocolate-y or sweet. The occasional bite of apricot seemed comparatively tart. Texture: Like a cake, not a brownie. Light/fluffy and moist. Appearance: Looks like chocolate cake. Can see chunks of fruit in brownies. Hand mix all ingredients with exception of apricots (may need to gently heat almond butter and honey and combine separately first). Fold in apricots evenly. Pour your batter into an 8in x 8in baking dish lined with foil or parchment paper (or greased with your preferred oil). Bake at 325F for ~30-40 minutes, or until a toothpick inserted into the middle comes out clean. (Took 40 minutes for me). Paleo Brownie Recipe 3 incorporates honey, diced dates and almond butter. Recipe 3 is the same as above in terms of all the metrics - the only difference is to replace fresh apricots with 1/2 cup dates. Pour 3 Tbsp hot water over dates and let them soak for a bit before incorporating into the batter. The occasional bite of date was very sweet and imparted a raisiny flavor. These took 30 minutes for me to bake (recipe above). Paleo Brownie Recipe 4 includes coconut flour, applesauce, and almond meal. Flavor: Strong chocolate flavor, very slight coconut flavor. Texture: Very heavy, wet, fudge-y texture with cake-like structure. 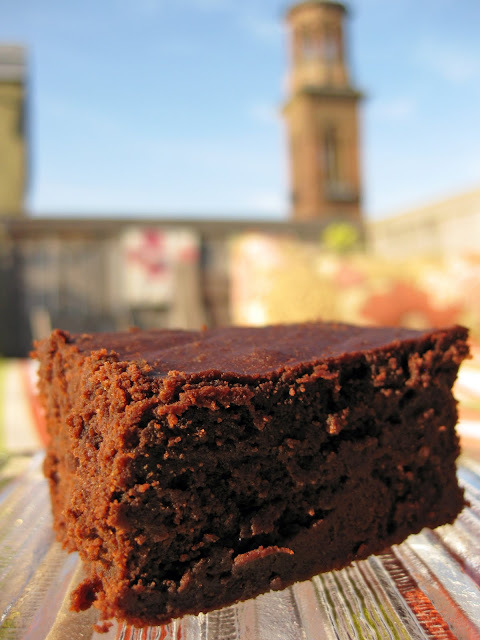 Appearance: Very dark brownies, some visible lumps of almond flour. Cut-ability: Awful...knife pulls half of brownie off as you cut through it. Whisk eggs until they lighten in color. Combine with other ingredients and mix. Pour into 8x8-in pan lined with foil or parchment paper (or greased with your preferred oil). Bake at 350F for ~30-40 min. Remove from oven when a toothpick inserted in the center comes out mostly clean. 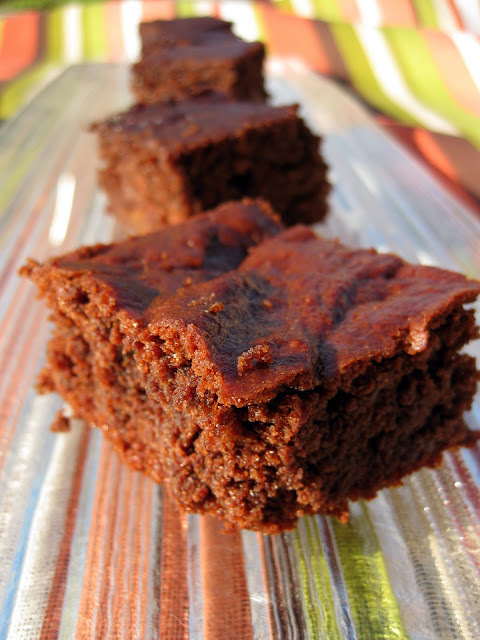 Paleo Brownie Recipe 5 relies on applesauce, honey, coconut flour and coconut oil. Flavor: Strong chocolate flavor and noticeable coconut flavor. Texture: Denser texture than recipe 4, still wet but less moist and less of a cake-y structure. Appearance: Very dark chocolate color, very solid-looking. Cut-ability: Very easy to cut. Knife slides right through without destroying brownies. Melt coconut oil (if solidified), mix with unsweetened cocoa and coconut flour. Add honey, applesauce, extracts, espresso powder, salt, and eggs, and mix. Line 8x8 pan with foil or parchment paper (or grease with your preferred oil) and pour batter in. Cook at 350F for 30-40min, or until toothpick inserted in center comes out clean. I didn't make 5 batches of brownies for nothin'! I set out to learn what makes a great paleo brownie through these recipes. Using what I learned I made my own, uber-delicious chewy paleo brownie recipe the following week. You can find the recipe in the link above or here. 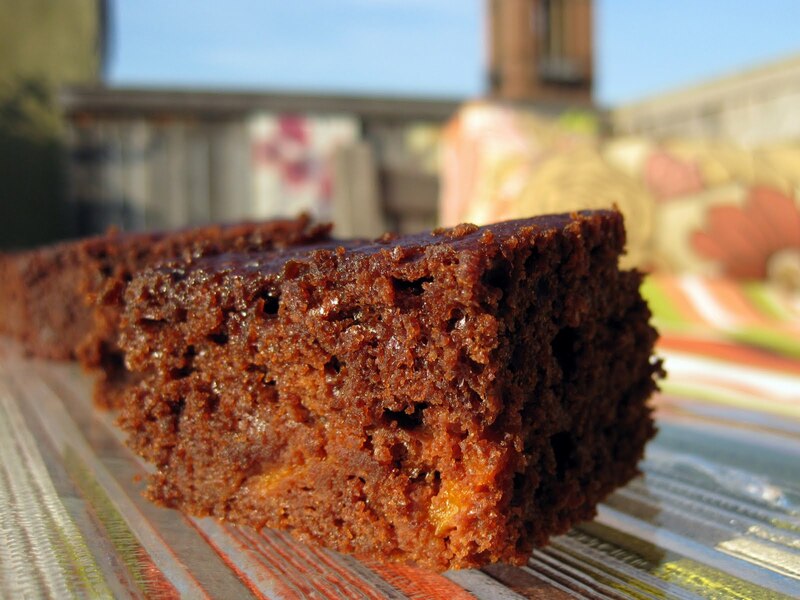 It is more like a traditional brownie than the above recipes (sweeter, chocolatier, without coconut or honey aftertastes), and can be made with or without an egg. Thank you for your nice article. There are many useful information. You're welcome! The recipe looked interesting, and I'm definitely glad I gave it a try. Your brownies had a very satisfying richness and denseness that appealed to my love for fudge-y brownies! Excellent review! The photography was beautiful as well! Thanks! It was such a beautiful day that day, and I was lucky to have the time to capture a bit of it with these photos - they help me remember it! You're welcome. The reason I try to avoid coconut oil in this baked good is not that it is unhealthy, but that it imparts a coconut flavor to the baked good. My goal is to make a brownie as close as possible in flavor and texture to a traditional brownie. For that reason, anything with a coconut flavor would detract from a traditional brownie flavor. The reason I avoid eggs in my version of the recipe is in part because 1) the recipe works fine with out them, so why waste an egg if it isn't needed, and 2) a friend of mine who eats paleo (who I designed the recipe on behalf of) tries to keep egg consumption at about 4 eggs a day...and he eats those four in the morning. So it's better if the brownies he eats don't contribute to that daily total! I am not trying to be a snob here, just want to inform you. It's not what it seems. Thanks! Feel free to substitute the agave nectar for your preferred sweetener, if you'd like! If you need help with substitution guidance, I'm happy to put in my own two cents, though I'm not familiar with all substitution rules of thumb. These came out like very dry bran muffins with a chocolate-like flavor. Darn. Followed the recipe to a T. Used Justin's almond butter which was maybe too dry? Hmmm! Yes, it could be the almond butter (the brand I use can almost be poured. I will look for it next time I'm at the store, and will note the brand in the recipe!). Another culprit could be honey, if you used that. Because honey is a natural product, the water content can vary quite a bit. I'm sorry they didn't turn out!